Existence of a Valid Contract - There must be proof that one party made an offer, the other party accepted the offer, and consideration was given, meaning each party gave and received something in return. Breach of the Contract’s Terms - Breaches that subtract value from the non-breaching party may be grounds for a lawsuit. Some breaches are minor, and would not hold up in court, whereas others such as material breaches are more serious and could result in a lawsuit. Damages for Breach of Contract - Once a plaintiff proves that the defendant harmed them by breach of contract, the court may award damages to cover expenses, lost money, and lost time. Depending on the circumstances, punitive damages may also be awarded to the plaintiff as punishment to the defendant. Agreements that cannot be completed within one year as required by the terms and conditions within the contract. 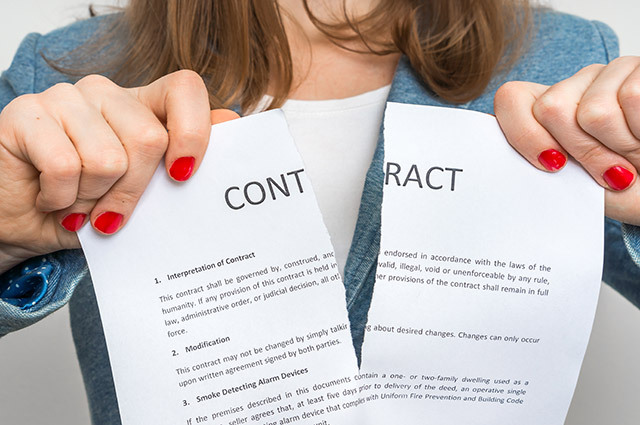 The Contract Is Not the Intended Agreement - If the agreement is not what was originally intended, the breaching party may avoid liability if they can show that other arrangements were made outside of the contract and that they changed the original intention. One Party Was/Is a Minor - If an individual was not of majority age, then breach of contract can occur without consequence. Mental Capacity - States differ on how mental capacity is determined, but generally, intoxicated individuals, minors, and those lacking the ability to understand or control their behaviors are viewed as unsuitable parties in the formation of a valid contract. Duress or Undue Influence - If a person is under extreme pressure or intimidation to sign a contract, the court may rule in favor of the breaching party. There Is a Mistake in Creating the Contract - If both parties (bilateral) made a mistake in the creation of the contract, it may be void. If only one party (unilateral) was mistaken, liability is possible. Unconscionable bargaining power - One party did not understand the consequences of the agreement. Take it or leave it clause - Unenforceable if one party agreed only because the other party refused to follow through unless both would agree to a provision within the contract. Risk shifting provisions - If all the risk is unfairly placed upon one party, this type of provision may release him from liability. Limiting remedies - Limits on remedies are usually valid, unless the court views them as unfair. Impossibility - The contract has become impossible for one party to perform. There are varying degrees, which will not always void a contract. Objective impossibility - The promised performance is absolutely and physically impossible to perform. For example, a new law went into effect that makes the promise illegal to perform. Subjective Impossibility - Similar to impracticability, it is nearly impossible to perform the promise, but not absolutely impossible. For example, an individual is unable to get a loan for something she promised to pay down, therefore she is in breach of contract. It may be impossible for her, but not for someone else. To further expand on a couple of the above defenses, unconscionable contracts may result in: the court refusing to enforce the entire agreement, only enforcing the remainder of the agreement without the unfair terms, or limiting the action of the unfair terms altogether. Will a Defense of Absolute Impossibility Always Discharge the Breaching Party’s Duty to Perform? Simply because an individual’s promised performance became impossible, does not mean they are automatically free from breach of contract liability. If they knew that the performance would become impossible, or if they actually caused the performance to become so, they may still be liable. This type of ruling is heavily dependent on the circumstances and factual information surrounding the case. Defense of Impracticability, similar to the impossibility defense, is when a contract is impractical to perform. Like an impossibility defense, an individual may try to use this defense in order to avoid liability. However, the impracticability defense is seldom successful as it must be proven that the agreement is exceptionally unreasonable to perform, not just too difficult or expensive. What Types of Damages Are Available for a Breach of Contract? Expectation - Damages the injured party expected to receive from the contract. Reliance - Damages the injured party incurred when performing their own duty, while relying on the fulfillment of the contract. Consequential - Also known as special damages, they are intended to cover losses that are not directly related to the agreement, but occurred as a result of the breach. Examples may include the loss of business opportunities, or damage to the reputation of a business. Liquidation - Specifically named damages within the contract, and are only awarded if they are reasonable. Punitive - Damages intended to punish the breaching party, but are rarely awarded in contract claims. Nominal - Damages for when financial loss is not an issue, and are intended to show that the breaching party was in the wrong. Restitution - Awarded to the plaintiff when the defendant benefitted from the contract, at the plaintiff’s expense. If you are dealing with issues involving breach of contract, it is a good idea to consult an experienced business attorney as soon as possible. Contractual liability can be complex, and your lawyer can help determine your best course of action, as well as represent your best interests in court.